Friends and family shared memories and thoughts about a longtime member of the University community. 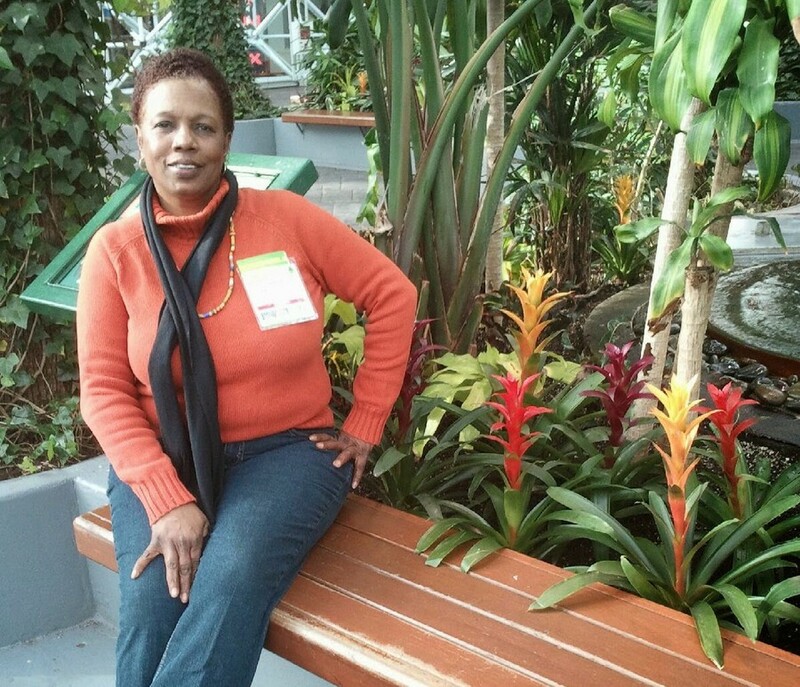 Pam Williams, a service crew mechanic at the University, visits the Navy Pier Botanical Garden. Pamela Benson Williams’s son Tarrae Benson is a guest author for The Maroon. Pamela Benson Williams was born on September 30, 1958 to Joseph and Margaret Benson in Chicago, IL. Pamela accepted Christ at an early age, as she was the church pianist at New Mt. Olive Missionary Baptist Church. As a young woman, Pam became so popular working as a cashier at the family-owned neighborhood grocery store that all the locals eventually renamed the store Pam’s. Pamela attended Enrico Fermi Elementary School and Hyde Park High School, and completed schooling at Harcourt High School where she received her diploma. Pamela was united in holy matrimony to Ronald K. Williams on October 29, 1993. She began work at the Chicago Park District and later moved on to her last occupation, which she loved, as a service crew mechanic at the University of Chicago. Pamela was very creative, smart, and a hardworking woman. She also loved her children very much and would often say that she only wanted the best for them. Pamela was loved by so many, but none more than her children. She was everyone’s favorite person and just a joy to be around. Her passions were gardening, landscape, and beautification. Pamela was preceded in death by her father, Joseph Benson; mother, Margaret Benson; and two brothers, Troy Benson and Andre Edward Benson. 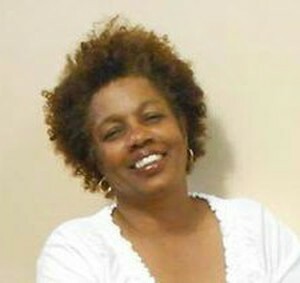 She leaves to cherish her memory her husband, Ronald K. Williams; four children, Tarrae Benson, Margaret Benson, Veronica Benson, and Laura Benson; six grandchildren, Kevonté, Janyia, John (BJ), Caleb, Mila, and Kamyra; six siblings, Cereta Carlie, Portia (Darren) Davis, Barbara Benson, Darrell Benson, Lisa (Curtis) Williams, and Joseph (Debbie) Benson, and a host of cousins, nieces, and nephews. She also leaves to cherish her memory a very special aunt, Armada Washington. Heaven has definitely gained a beautiful, fun-loving angel and she will be missed by many. Several of Pam's family members and friends shared loving messages and memories. Pam was a very loving and caring wife. She was also a very strong woman and a wonderful friend. Pam was a very creative person. There was very little she could not do. Anything she could do to help someone she would gladly do it. She was the kind of person you can never forget. I miss her dearly! Mom, no words can express how much I love or miss you. You were definitely the number one blessing in my life and the wind beneath my wings. Rest well you deserve it. Save a seat for me. 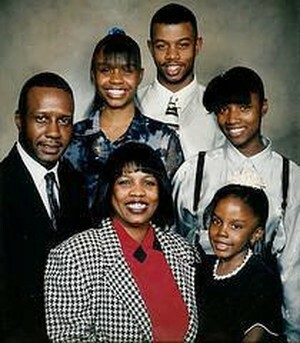 Pam Williams, pictured with her family. Mommy, I'll always love you and I really appreciate all you have done for me and my family. It hurts now that you have gone on to a better place. I know you are no longer suffering. Kamyra looks at your picture every day. So sad that your time with her has been cut short but I know she loves and misses you. She couldn’t quite say “Grandma” but you knew what she meant. Mommy, you are my shining star. You have set the bar very high. I will forever love and miss you. Mommy, you were my rock always there for me no matter what task. From me needing a last minute recipe, kids’ school projects, my personal AAA, and much, much more. Thank you for everything. Mommy, You were the true definition of beauty, inside and out, no one could compare. I don't know if you really knew how I admired you deeply. Your strength and creativeness never ceased to astonish me. Whenever there was a problem you had the solution. Words cannot begin to depict how much you meant to me and to everyone that ever had the pleasure of knowing you. Every day I spoke with you, to talk about my aspirations, my obstacles or just how my day was going. Every day I found comfort in knowing that I had you to guide me. I truly wish we had more days with you on Earth. Even now, you continue to guide me, through the challenges that everyday without you brings. You continue to guide me through my hurdles and shortcomings. Your spirit gives me strength to find the good in each day and to go on and fight another day. Your personality was much like a rare jewel, regardless of what pressure you were going through personally, if you could do something to brighten someone else's day you did. Someone like that is hard to find in this world. You have taught me so much. In many ways I aspire to be like you, in the way that you handled life is similar to the work you loved to do, if given soil and bull crap from it you would grow. Blossoming before our eyes, an enchanting garden for those spectating to admire and wonder how you did it. Every day Mila and myself talk about all the fond memories we have with you, as she grows up I will continue to always make sure she knows how much you love her and continue to look after us. Whenever we pass by your house she says, “That's my grandma's garden.” And I think that is among everyone's fondest memories of you, how you took soil and seed and nurtured it into beauty. Ms. Pam was a sweet and funny lady who would always make you laugh. I’m really going to miss seeing her around and hearing her voice and eating her delicious spaghetti. Pam Williams with a young friend, the son of former University Resident Head Lindsay Banman. Pam always spoke directly to my boys and made them feel so important and loved. They have come to love gardening themselves and I believe that’s hugely in part because of Pam’s influence on them. One day we were walking to school when we saw Pam was raking leaves. She was getting ready to collect the leaves when my youngest son, just one at the time, jumped into the leaves. I went to call him back to me and Pam said, “Let him play! It’s ok! I can rake the leaves again. Just let him play.” She piled leaves all over my three boys and laughed and laughed. We were late to school that day but it didn’t matter because Pam once again had showed us the importance of slowing down and treasuring each moment. When I was pregnant with our third child she was so kind and would always inquire about my health. And she told me all about her own grandbabies, all of whom she loved to the moon and back. She had a radiant smile, and it was contagious not only to us but to staff and students alike. Some people have to take classes to learn about community building but to Pam, this came naturally. She made everyone around her feel important and heard.… She was a kind, good, hardworking woman, and she was our friend. We miss her, and we will never forget her. The Joy of my life has passed on to another life. Her smiles, her laughter, her joking and her telling of stories in the past. I miss her hugs, I miss talking to her almost everyday. I miss you Mimi and I will always think about you and I will always LOVE YOU, MY HEART!!! To have had you for a Sister was the greatest one of all. But as God takes us one by one the chain will link again. Thinking of you, Sister Pam. Although I'm sad without you and wish you we're still here. I will always treasure the time we spent and chat together. Although there are so many things we didn't get to say. You played a big part of my life, but now that you are gone. The love I have for you will just go on and on. It broke my heart to lose you sis, but to stay, just brought you pain. Love alone couldn't save you but I know we will meet again. Goodbye to you too dear sister. My grandma, also known as my teddy grahams, was and still is my number one supporter. When my mom told me and my brothers that my grandma was dying I didn't want to hear it. When the hospital released her home we went over there everyday with hope that she would live. I hated each and everyday because I didn't want to see her dying everyday and see her when she passed. But my grandma was the nicest and most loving person you could ever meet. She helped and supported me through everything. I miss her so much but I know my queen has entered heaven's gates and no longer has to suffer. I love my grandma with all my heart and she will forever be missed and cherished but I know that I have to remain strong for her. My grandma was very talented. She loved to draw, garden, and was like my personal doctor. No matter what the injury was she found a way for me to feel better. When it came to my athletics and academics she was my number one supporter alongside my mom. Granny used to tell me to hurry up and make it as a pro ball player so I can take care of her as she did for me. Even though her body is no longer with me to see me accomplish our dream I know she’s still with me in mind and spirit. My granny didn’t quit when she was on her deathbed. She fought with every breath she took and to see that, motivated me to never quit on anything. From sports to academics and to rebuilding a bond with my loved ones. My granny showed me that giving up was never an option and that’s the mindset that will stick with me for the rest of my life. I love you, granny, thanks for all you’ve done in my 17 years of being with you. Grandma, you’re the best in the world. You were a good person and a great cook. The family events won’t be the same without you. I love you, Grandma, and you will be missed for everything you did. I wish I had more time to spend with you but I will treasure the time we shared.